A diagram of effects illustrating these two loops in the Restructuring-Fear Cycle. View a larger image. The turquoise ovals represent quantitative amounts. For example the oval labeled "Need for Restructuring" represents a measure of the perceived need for a restructuring exercise. The oval labeled "Health of Relationships" represents a measure of the relative health of interpersonal relationships in the organization. An arrow connecting one oval to another indicates that an increase in the first quantity contributes to an increase in the quantity it points to. Thus, an increase in Health of Relationships contributes to an increase in Results. An arrow bearing a red circle indicates a negative relationship. Thus, an increase in Risk Confusion contributes to a decrease in Healthy Risk Appetite. Following the arrows around any loop in such a diagram, if we encounter an even number of red circles, such as 0, 2, 4, and so on, then that loop represents a positive feedback loop, and the quantities in that loop can "run away" unless Management (or the laws of economics, psychology, or physics) somehow intervene. 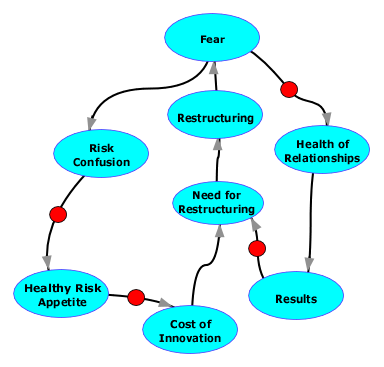 This diagram, which illustrates only some of the phenomena affecting the Need for Restructuring, has two such loops, which implies that there are two pathways that can cause a runaway need for restructuring. Decisions about restructuring usually depend on models that show how different approaches might affect the enterprise, by projecting the values of organizational attributes such as net income, market share, or shareholder value. Although these projections rarely include attributes like employee anxiety or fear, such factors are truly important. They help to determine productivity, voluntary turnover, the workload of the people in Human Resources, and many of the attributes that the experts do model, albeit indirectly. Most important, restructuring-induced fear can create a need for future restructuring, through a variety of paths, some of which are subtle and rarely identified. Here's Part I of an exploration of some of the less obvious mechanisms by which restructuring-induced fear creates a need for future restructuring. When we relocate people, eliminate positions, or merely change reporting structures, we disrupt relationships between people. Those who formerly relied on each other for advice, instruction, or services must sometimes find new contacts. Even the relationships that aren't totally eliminated can be degraded by restructuring-induced fear, in the form of competitive attitudes that can take hold when people come to believe that further restructuring is possible, and that everyone is in competition for a declining number of jobs. Although relationships between and among employees are valuable organizational assets, the value of these assets doesn't appear on financial statements. Unaware of the amount of these assets lost to restructuring, the depressive effects on results seem surprising to planners. The unexpectedly disappointing results can sometimes lead to further restructuring. in general declinesjobs are at risk, their appetite for risk in general declines. In effect, some people have difficulty keeping separate their own personal risk profile and the risk profile associated with their job responsibilities. This can affect the necessarily subjective judgments people make as part of their responsibilities, which creates a risk aversive approach to operating the enterprise. After experiencing several serial restructuring events, people in organizations that formerly had a healthy approach to risk can find themselves being overly conservative in their strategies and tactics, because they have begun to confuse their own personal risk experience with the risk experience of the organization. In this way, the organization can become so risk averse that it is no longer capable of accepting the levels of well-managed risk that are so necessary in today's market environments. These organizations then find that they can innovate only by acquiring innovative organizations, which is an expensive method for attaining market leadership. The resulting high costs and low yields sometimes lead to further need for restructuring. Would you like to see your comments posted here? rbrenXcMXiXWBMQbkMxDvner@ChacvutlezjfavHvDbCtoCanyon.comSend me your comments by email, or by Web form. See also Emotions at Work and Organizational Change for more related articles. I offer email and telephone coaching at both corporate and individual rates. Contact Rick for details at rbrenvEnoZELoziiHXYZOner@ChacuViToTzWAKYHZsQToCanyon.com or (650) 787-6475, or toll-free in the continental US at (866) 378-5470.